BBS Icon/Header Image Update Broken? I guess another question is...do you SEE an icon right now for my avatar? Could be problem on my end too...Been noticing an increasingly invasive Avast as of late, even going so far as to breaking google drive for me when active. What System Do You Think Of? I'm curious as to how people look at the Pico8. While it is it's own thing completely unlike any other real console, it does share some similarities to quite a few of them, if changed somewhat still. I myself can't be helped to be reminded of how similar it's sprite capabilities and FPS being locked to 30 and color output are similar to the Atari Lynx and so I tend to think about games I would've loved to have seen on it (though the sounds on the Lynx is way better! lol) . However, I think Pico8 also does a good job of feeling like a Gameboy Color or Palm Pilot OS3 type device as well, maybe a NGP? Does anyone else think of the Pico8 as some kind of way to feel like your idea for some console-specific game to come to life or does everyone else kinda just shrug and think 'this is pico8, this isn't anything else at all'? Testing out an engine for Super Scaler games. It's still work in progress, much is needed to be worked out with how I ultimately want to handle the slices (tiled 8x8 images or custom stretches and sizes for everything?). Currently, sorting of the layers is not in there as I'm having trouble figuring out the best way to use FOREACH(). I want to ADD and DEL from the tables that make up the sprites, and then use FOREACH() to do the scaling rather than arbitrary FOR/END loops based on a sprite limit. The idea is that if I can keep adding to the front and deleting from the back, then I don't need to sort anything (i.e. speed increase)...but I can't get it to work! Screensaver for when you're tired of playing small games. Every button does something. Not all of it will benefit your experience. Most effects will not be immediately noticeable. Simply hold the button for the effect long enough for it to become noticeable. Letting go of the button leaves the setting as it is so don't expect going neutral on either p1 or p2 pads will grant you any savior of frame rate. This was a small research project for a planned item for the future. Feel free to enjoy the source for your own works. There's also a song in there commented out at the top fo the script if you're bored with flying squares. Platformer - Controls would be one stick for movement and 2 or 3 buttons for actions, one of them shoot, one of them jump, one of them free assign (i.e. use item?) and have option for the map to 'lock axis' to keep free 360 movement from happening either on x or y axis depending on the person making the stage. RPG - Same as platformer without scroll locking, jump would be optional button. That's just some examples of how it could work. In the main voxatron control setups, the user could set their own controller options per type of level that way they don't have to remap them in the middle of a game. It's already setup for all possibilities to their preferences before they play a cart. I think it'd fairly easy to add these 'base modes' to the editor and even have it on a per level basis that way if someone wanted to go all out with one of those old NES games that have multiple modes (like Bayou Billy or Vice: Project Doom), then these modes are tied to the level itself, not the entire cart. Anyone have comments on this? Yay/Nay? In the spirit of Voxatron, I created ANSITron for Petitcom on Nintendo DSi. Here's a short video of me trying to play it through an iPod screen and keep from dying and keep the game in center frame. Hint: The results are me playing extremely bad! Basically, it's Robotron done in ANSI characters available stock in Petitcom, thus really 'blocky' movement of everything. There's only 4 kinds of enemies and 10 specific level designs before it generates random levels until you get a game over. 3 of the enemies (Green, Yellow and Red) are destructible. The Grey enemies are not. They wander around seeking to destroy diamonds, which are your bonus points (and each one you collect doubles in points, so grabbing as many as you can without dying will net you some extra men!). The 3 destructible enemies just move towards you faster and faster. Depending on their color, they take up to 3 hits to destroy. If you touch anything other than a diamond, you lose a life. My highest score was around 500k and I got to the 13th level. There is a bug that causes it to crash randomly and I could not find it because it doesn't show up until after about 30 games...very hard to track! At any rate, the download link to the QR codes is in the description if you have Petitcom. If you have a DSi/3DS, you should check out Petitcom, it's a neat little mini dev kit available in Nintendo eStore. I took an outline someone else did and attempted the same sort of coloring style...this doesn't have 'tall pixels' but does follow the 8 colors only scheme of PC-88. I used D-Pixed and layers using it's built in dithering patterns, alternating color/transparent spots in the two colors available. This one was started from scratch. 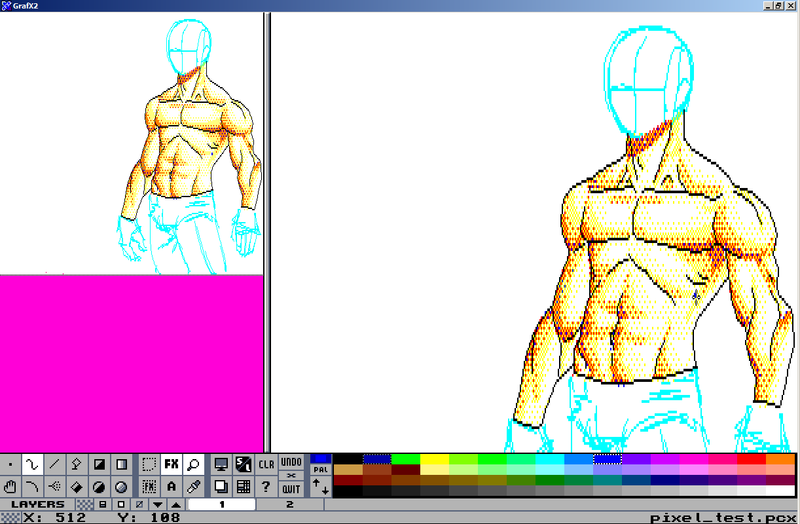 No intention of finishing it but uses tall pixels and was done using GRAFX2. I noticed at the bottom of the PNG save files is some 1bit noise that is likely monster/event data. I'm working on a program in PetitCom for Nintendo DS and have run into an issue where I have massive amounts of data I need to convert to an image in order to save and load it but I can't think of how to do this properly and have all the data save in the alloted space of the image (256x192x256). To be in more detail, I am trying to save map data. For each map, there's 32x24 tiles. For each tile, there's a 3 digit pointer for the image, a pair of 2 digit pointers for colors of the tile to be used, and several other 1 digit pointers for various other tile properties. Take each of these and multiply it x2 minus the tile graphic and colors. So you're looking at approximately, if they were all put together in a single string, about 32 characters ('m just using 32 to make it easier to work with in the whole powers of 8 world). so can't quite figure out how to do this...any insight on converting this kind of thing into an image would be helpful. Ultimately, I'd like to stack all of that data into a single pixel since I have option for 256 colors instead of just black or white, but any advice I'll definitely take.